Father Rick Frechette established a medical program which would later become St. Damien Pediatric Hospital. St. Hélène Foyer, the main children’s home, is located 5,000 feet above sea level in Kenscoff, about 25 miles from the capital of Port-au-Prince. It is home to more than 400 children. St. Damien Pediatric Hospital in Tabarre, a suburb of the capital, is the nation’s premier children’s facility. Father Wasson Angels of Light in Tabarre provides a home and school for vulnerable and displaced children. Don Bosco in Tabarre is a higher education program for youths who graduated from St. Hélène and are attending high school, university or technical schools. As a result of the 2010 earthquake, NPH/NPFS Haiti suffered the tragic loss of staff, volunteers and family members, as well as extensive facility damage. Despite these losses, by year’s end, they assisted over one million people. 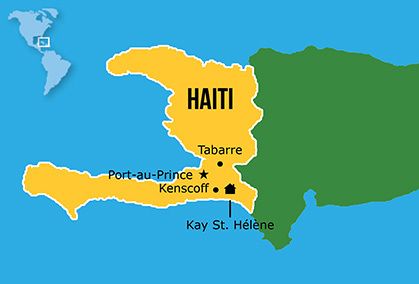 Following an earthquake near Port-de-Paix in 2018, NPH and its sister program, the St. Luke Foundation for Haiti, distributed 600 sacks of rice, 200 sacks of beans, 600 liters of cooking oil, and 250 sacks of pasta, providing more than 1,000 children with three meals a day. In 2018, a multipurpose space was constructed at the outpatient school and rehab facility Kay St. Germaine. It has areas for sports and dance for special needs students, and training workshops for staff, parents and patients.